For most of our reading lives the morning paper was a part of my family’s breakfast routine. One shared paper made its way through all our hands as we ate before school and work. The morning news is still how we start our day although now we read it on our individual tablets instead of a shared paper. This morning my sister and brother-in-law, who are visiting us, read the news while I took advantage of the opportunity and sketched them. 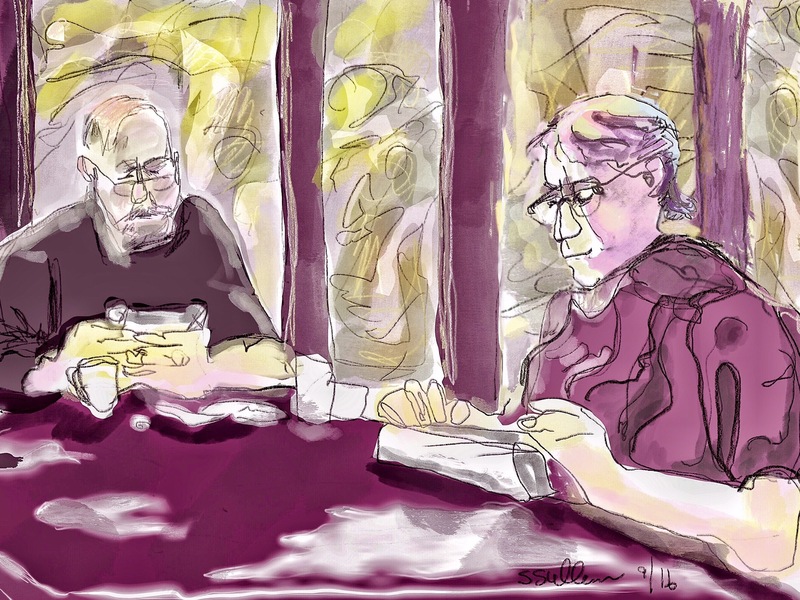 I wanted to capture the way they focused on their tablets as they sat side by side, sharing the news. I continued today with a limited palette of two complementary colors and worked to get a range of tones into the sketch. This entry was posted in Body Language, Facial Expression, Groups Interacting, Telling a Story and tagged Procreate, San Diego. Bookmark the permalink.